Organizations interested in affiliating with the Smithsonian Institution must submit a proposal to Smithsonian Affiliations. New Affiliate applications will be accepted in Fall 2019. Please review this PDF to understand the information needed for Smithsonian affiliation. A brief overview of the documents required is listed below. If you feel that any of these documents does not pertain to your organization and, thus, are not included in your application, you will be asked to please provide a brief statement indicating which documents are not included and why. 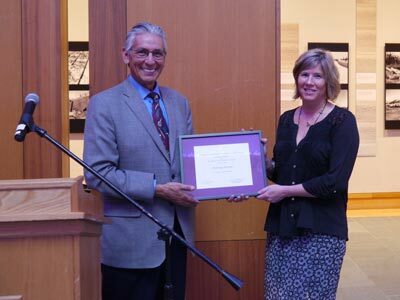 The Smithsonian’s National Museum of the American Indian Director, Kevin Gover, presents the Anchorage Museum Director, Julie Decker, with a certificate of Affiliation when the museum became a Smithsonian Affiliate in 2014. Photo courtesy of the National Museum of the American Indian.